The Carbon Tax: Analysis of Six Potential Scenarios is a study commissioned by IER and conducted by Capital Alpha Partners. The analysis uses standard scoring conventions (similar to those used by JCT, CBO and Treasury) to evaluate and model the economic impacts of carbon taxes set at a variety of dollar figures, with different phase-in durations, and with an array of revenue-recycling strategies. A carbon tax will not be pro-growth. 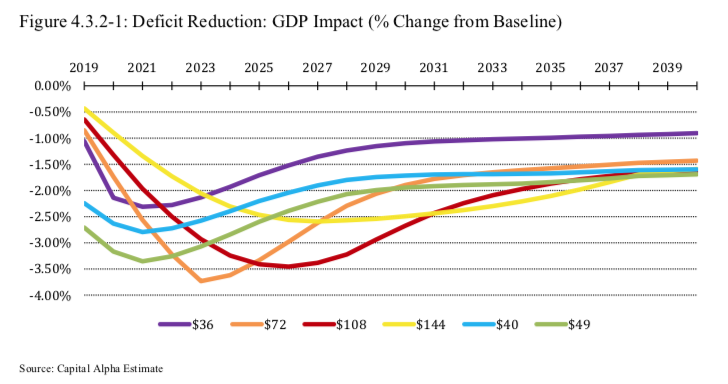 Most carbon tax scenarios reduce GDP for the entirety of the 22-year forecast period. Better than break-even economic performance may not be possible unless revenue is devoted entirely to corporate tax relief. A lump-sum rebate results in lost GDP equal to between $3.76 trillion and $5.92 trillion over the 22-year forecast period. A carbon tax is not an efficient revenue raiser for tax reform. Using standard scoring conventions, a carbon tax is likely to only produce net revenue available for tax reform of 32 cents on the dollar. No carbon tax modeled is consistent with meeting the long-term U.S. Paris Agreement INDC. As a standalone policy, consistent with World Bank and IEA estimates, all carbon tax scenarios analyzed are far off of the trajectory the Paris Agreement sets for 2040, undermining claims that a tax-for-regulation swap will satisfy emissions commitments. Depressed GDP leads to long-term fiscal challenges, with particular stress on states. Persistent reductions in economic performance lead to trillions of dollars in lost GDP, thereby reducing state tax revenues and straining state budgets. The average annual burden on the states and local government during the first 10 years of the tax would range from $18.9 to $30.6 billion. We present a macroeconomic analysis of current representative carbon tax proposals considered as if they were actual legislative proposals before Congress and scored using scoring conventions similar to those used by the Joint Committee on Taxation (JCT), the Congressional Budget Office (CBO) and the U.S. Treasury Department Office of Tax Analysis (Treasury). We model six carbon tax scenarios. Two are carbon taxes that begin at a set rate and increase annually. These taxes begin at $40 and $49 dollars per metric ton of CO2 and increase annually by 2%. Four are carbon taxes that phase in over time to a terminal value. These are taxes with terminal values of $36, $72, $108, and $144 per ton. All are in constant 2015 dollars. A special focus of our study is the role of a carbon tax as a revenue raiser in pro-growth tax reform. There have been many suggestions that a “tax swap” of growth-oriented tax cuts financed by a carbon tax could produce incremental economic growth. We find that this premise would be difficult to achieve using standard scoring conventions. We also examine the possibility of a tax-for-regulatory swap in which a carbon tax would replace all existing regulation and still allow the United States to meet its obligations under the Paris Agreement. We find this premise difficult to achieve as well. A carbon tax would reduce emissions but could still only achieve Paris Agreement obligations as a part of a comprehensive carbon mitigation plan. This is in agreement with World Bank and International Energy Agency (IEA) conclusions and is consistent with the Treasury’s own modeling. A carbon tax is not an efficient revenue raiser for tax reform. Using standard scoring conventions and assuming that Congress would protect tax payers in the lowest two income quintiles from a tax increase, a carbon tax produces net revenue available for tax reform of only 32 cents on the dollar. Net revenue decreases still further when considerations such as federalism and revenue sharing come into play. A carbon tax pushes static costs and revenue burdens on to the states and local government. Based on JCT and CBO estimates, we find that static costs and revenue burdens equal to 11% of federal gross revenues from a carbon tax would flow through to the states and local government. In the scenarios we study, the average annual burden on the states and local government during the first 10 years of the tax would range from $18.9 to $30.6 billion in constant 2015 dollars. Dynamic revenue losses to the states and local government could make the total costs higher. No carbon tax we model is consistent with meeting long-term U.S. obligations under the Paris Agreement as a standalone policy. Two scenarios, phased-in taxes of $72 and $108 per ton, are capable of meeting the U.S. minimum Intended Nationally Determined Contribution (INDC) for 2025. Other scenarios achieve meaningful reductions, but all are far off the trajectory Paris requires by 2040, a finding which is also consistent with World Bank and IEA estimates. Vertical tax competition impedes infrastructure development. Historically, all excise taxes collected on motor fuel at the federal and state level have gone to the states to finance transportation infrastructure. A federal carbon tax would raise 38% of its revenues from motor fuels. Without revenue sharing, none of this would go to the states. The federal government would collect the majority of excise tax revenues from motor fuel. All incremental revenue would go to the federal government, and states would likely be pre-empted from raising their own motor fuel taxes to finance highway construction for a period of years. Carbon tax-financed tax reform is unlikely to be pro-growth. Most tax reform and tax swap scenarios modeled lead to reduced GDP relative to the reference case for the entirety of our 22-year forecast period. Better than break-even economic performance with revenue-neutral tax reform may not be possible under standard scoring conventions unless distributional concerns are completely ignored, and low-income taxpayers bear the cost of corporate tax relief. Depressed GDP leads to long-term fiscal challenges. Small but persistent reductions in GDP relative to the no-tax reference case over a period of many years lead to trillions of dollars in lost production, with challenging implications for federal, state, and local government finances. Sensitivity analyses of the Budget of the United States Government conducted by the Office of Management and Budget (OMB) underscore the cost of even temporary, cyclical losses. We consider five simple revenue-recycling strategies and three mixed revenue-recycling strategies. The simple revenue-recycling strategies direct all net revenue to a single tax reform or tax swap proposal. The mixed revenue-recycling strategies simulate a Congressional exercise in tax reform in which available net revenue is directed to more than one policy option. We find that break-even or slightly better performance relative to the no-tax reference case requires the majority of, if not all, net revenue from the carbon tax to be directed to corporate tax reform, regardless of the regressive impact this would have on lower-income taxpayers. Such tax reform may also require larger corporate tax cuts than are truly revenue-neutral given scoring constraints. A review of studies from the World Bank and IEA put the carbon taxes we model into a global context. The carbon taxes we examine, if enacted, would be the highest economy-wide carbon taxes in the world. They would raise average annual revenues of up to nine times the total amount of carbon-related revenues collected worldwide in 2017 during their first 10 years. In our study, we rely on standard data and projections from government sources only. These sources include the IEA, World Bank, Organization for Economic Cooperation and Development (OECD), JCT, CBO, Office of Management and Budget (OMB), Energy Information Administration (EIA), Bureau of Economic Analysis (BEA), Bureau of Labor Statistics (BLS), and Census Bureau. We perform our economic modeling with a commercial macroeconomic model that has been widely used for public-sector forecasting at the state and local level for decades. We estimate carbon tax revenues raised and carbon emissions reduced using an open- source model developed by a state government to assist in the implementation of a carbon tax.